Dimensions 1.47 by 6.66 by 9.50 in. 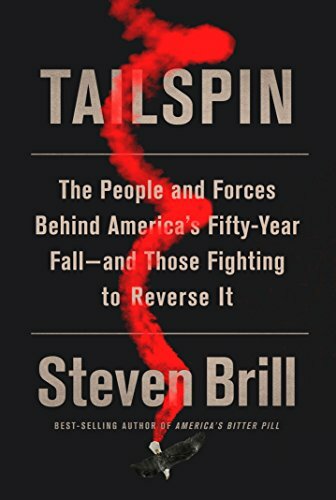 Amazon.com description: Product Description: In this revelatory narrative covering the years 1967 to 2017, Steven Brill gives us a stunningly cogent picture of the broken system at the heart of our society. He shows us how, over the last half century, Americaâs core valuesâmeritocracy, innovation, due process, free speech, and even democracy itselfâhave somehow managed to power its decline into dysfunction. They have isolated our best and brightest, whose positions at the top have never been more secure or more remote. The result has been an erosion of responsibility and accountability, an epidemic of shortsightedness, an increasingly hollow economic and political center, and millions of Americans gripped by apathy and hopelessness. By examining the people and forces behind the rise of big-money lobbying, legal and financial engineering, the demise of private-sector unions, and a hamstrung bureaucracy, Brill answers the question on everyoneâs mind: How did we end up this way? Finally, he introduces us to those working quietly and effectively to repair the damages. At once a diagnosis of our national ills, a history of their development, and a prescription for a brighter future, Tailspin is a work of riveting journalismâand a welcome antidote to political despair.